This floral wallpaper was produced in the early 20th century where the large-scale floral motif and scrolling stem and foliage convey the organic and sensuous nature of the art nouveau style. This paper is part of an unbound wallpaper sample book that contained a wide variety of designs in the art nouveau and Mission styles. It is printed in a monochrome colorway of very light blue on a slightly darker ground color. The ground color contains powdered mica which gives the pigment a reflective quality and would create a silk-like effect. The monochrome coloring also copies the look of a silk damask. The design is rendered very flat with no highlights or shadows. Closer inspection reveals the inclusion of unrelated patterning on the foliage and inside the flower petals which gives the design a little Rococo flavor. Each petal contains a unique design, from stripes to scallops to polka dots. This device is frequently seen on Rococo Revival wallpapers, where similar motifs are used to ornament the scrolling framework. The Rococo Revival papers are also frequently printed on grounds that imitate silk, either with a moire pattern or a polished ground, which can be seen in the image below. 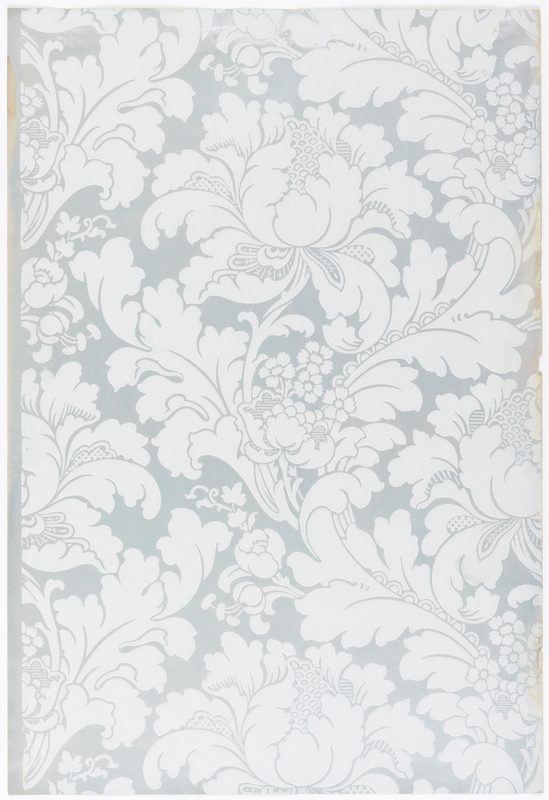 This paper could have been used to cover the walls from baseboard to crown molding but was most likely paired with another wallpaper or hung above a wood wainscot. Being printed in this low contrast color scheme would make this an excellent backdrop for hanging artwork. Greg Herringshaw is the Assistant Curator of the Wallcoverings Department. Thank you for today’s treat. Beautiful rococo wallpaper. Love it.